Born in Majorca, Spain in 1986, Rafael Nadal Parera first picked up a tennis racket aged 3 and is currently is considered to be one of the best clay court tennis players. Giorgio Armani saw his modelling potential; however, the truly multi-talented professional Spanish player is a multiple Grand Slam tennis champion, winner of 2 Wimbledon’s, a record nine French Open titles and the U.S Open, well-known for his tenacity and aggressive topspin swing, the combination made him one of the top tennis players in the world. His Uncle Toni, a former professional tennis player noticed Rafael’s natural talent for sport at an early age and introduced him to tennis. Nadal won an under 12 regional tennis championship by the time he was 8 years old, although he was also a promising football player at the time. His uncle intensified his tennis training and encouraged the young star to play left handed to gain advantage on the court. At 12 he won the European and Spanish tennis titles for his age group and turned professional in 2002 at age 15. By the time Nadal was 17 he was the youngest male player to qualify for the 3rd round at Wimbledon since Boris Becker. His first big win came in 2005 when the 19 year old enjoyed a victory in the French Open, it was the first time he played in the Grand Slam and his world ranking rocketed to number 3. In the same year he won 11 singles titles with at least eight taking place on clay and Nadal was dubbed the “King of Clay”. The King of Clay went on to win the 2006 French Open in 2006 despite his shoulder and foot injuries and won four titles in that same year. Nadal won the French Grand Slam again in 2007 plus another five titles. 2008 was one of his best years, during which he won the French Open for the third time. Played his rival Roger Federer in the final at Wimbledon for the third consecutive year, it marked one of the most anticipated matches of their rivalry; Nadal had a 23-match winning-streak upon entering the game, while Federer had reached the final without losing a single set. The game was the longest matches in terms of timed play on court in the history of the Wimbledon finals, due to a rain delay and in near darkness, Nadal won the fifth set 9 – 7 in a match widely regarded as one of the greatest finals in the history of Wimbledon. Nadal won his first Wimbledon title in 2008 and became the third man in the open era to win both Wimbledon and the French Open in the same year. He also ended Federer’s record streak of five Wimbledon wins in a row and was the second Spaniard to win the British tennis tournament. In the year described as one of his most successful, he also won the U.S Open series and his second Rogers Cup and he became the number one in the world for the first time, which ended Federer’s rule of four and a half years at the top. He won gold at the Beijing Olympics where he made history by becoming the first male player to do so while ranked in the top five. 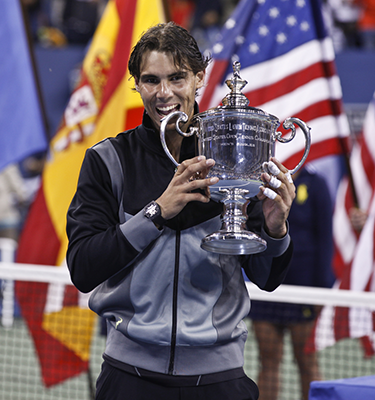 2009 held more success; Nadal was awarded the ATP World Tour Champion Trophy. At the Tennis Australian Open, he won five matches without dropping a set and defeated Fernando Verdasco in the semi-finals, in a match that lasted 5 hours and 14 minutes, which set him in up a championship match with Federer. Nadal defeated Federer in five sets making him the first Spaniard to win the Tennis Australian Open and the fourth male to win Grand Slam singles on three different surfaces. He won his thirteenth Masters 1000 World Group series tournament at the 2009 Indian Wells Masters and won a record fifth consecutive singles title at the Monte Carlo Masters. Nadal also won the Golden Bagel Award for the third time in 2009 and set a new record for Award wins. Nadal has the highest career winning percentage in the ATP Tournament history and his 81 match winning streak on clay is the longest streak for any player on any surface. Since 2008, he made the finals in 62 of the 107 tournaments. 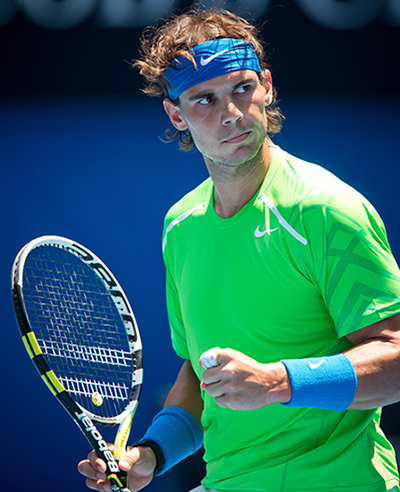 Nadal wrote in his 2010 autobiography that he is afraid of dogs and doubt their intentions. His favourite movies include Titanic and Gladiator; he also has a liking for golf, fishing, football, and PlayStation. Nadal rejoices each titles win in the same way and from 2005 to 2008 and again in 2010 and 2013 his victories were celebrated with his signature back flip. He always want to get an Aston Martin, but his father was against it and told him when he wins at Wimbledon he could buy one. Nadal says his father never thought he’d lose the bet, in 2008 after he won at Wimbledon, he bought himself an Aston Martin. His mother says he likes chocolate cookies and does not like tomatoes, cheese, or ham. His sister says he is afraid of thunderstorms and deep water, a nervous bike rider and prefers to sleep with the lights on. Although Rafael plays left-handed, he writes right-handed, and he was the first leftie to be ranked number one since John McEnroe in 1984. Fans always get his autograph and those who don’t say please, simply don’t get a smile. He earned about $28 million from endorsements in 2014, and his biggest contract is with Nike who pays him an annual amount estimated at $10 million. He plays wearing a custom-made Richard Mille watch valued at $800,000, specially designed to accommodate his two handed backhand. The watch is made of quartz, titanium, and carbon with a Velcro strap and can withstand 5,000 Gs of force. There are only 50 ever made and weighs 20 grams. Can he make to 2nd round this year?